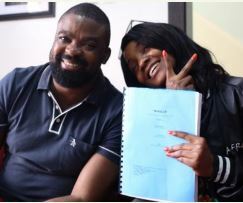 The Ondo-born singer who signed a contract at Kunle Afolayan’s office in Lagos today will be playing the role of the daughter of a cafeteria owner whose character holds a significant part in the movie plot. 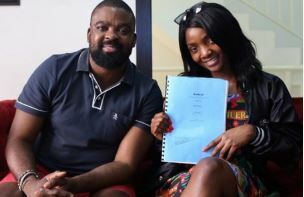 Mokalik, an all-Yoruba cast movie will star Simi, Femi Adebayo, Lateef Adedimeji, Faithia Balogun Williams, Wale Akorede Okunnu, Alabi Yellow (Dayo Akinpelue) and Papi Lolo (Ayo Ogunshina). The movie is Nollywood’s first single-location shoot. See more photos from the contract-signing that held at the home office of the actor in Magodo Lagos this morning. According to her last IG post, Simi loves the movie script.